Get Your Brake Repairs Dunn Right. Dunn Fast. Dunn Affordable. Dunn’s Brake & Tire provides quality maintenance and repairs for both foreign and domestic cars in Waco, Texas. With almost forty years of experience, we are proud to bring you the best service with the most affordable price. We employ only certified technicians using the latest in diagnostic tools and equipment. Our team works quickly and efficiently to correctly identify your auto service needs and will only make repairs with your approval. Same day service is available in most cases; simply drop you’re your vehicle off first thing in the morning and take advantage of our free shuttle service to work, school or home. 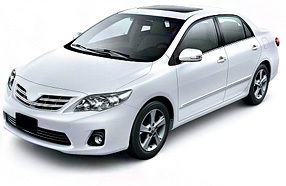 We offer affordable prices and nationwide warranties on most repairs. We are proud members of TECH-NET Professional Auto Service, an elite performance network, where independent service facilities share common goals of being world-class automotive service centers. Swing on by and let us help you get back on the road safely! 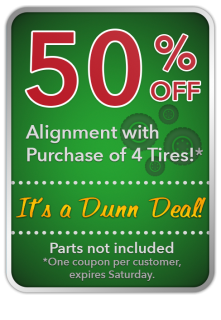 Save Money at Dunn’s Brake & Tire with our regular “$12 Off Any Repair” coupon and coupons for Weekly Specials. To Print Coupons Click Here! Going to Work, Home or School — Just let us know if you need a ride. Our Shuttle Service is ready to go at 7:30 every morning. Drop your car off and GO! on Lake Air Drive in Waco. © Dunn’s Brake & Tire, All Rights Reserved.